Thoughtful designs permeate each apartment and community venue, offering residents a personal retreat perfect for any lifestyle. Melt into the refined, modern ambiance provided by a blend of unparalleled features and amenities. Custom color schemes and optional accent walls offer a certain panache to each elegantly-designed floor plan. Natural light emanates from tall, expansive windows and vibrant sunroom options. Top to bottom, The Luxe at Creekside offers unsurpassed quality and style. Browse our gallery to further take in the debonair features of our community. 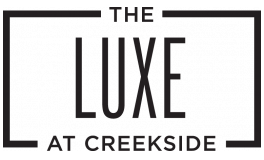 Apply today to make the Luxe at Creekside your next home.